Join us for a tasting of gins brought to you in your office or at an off-site venue. Gin has experienced a huge surge in popularity as the drink of choice in bars across the UK, so we've devised a tasting menu that will take you through the different styles. To add fun we can pitch the event with a competition in teams, keeping score to announce the winning team at the end of the session. We can provide a Gin Bar at networking events with tasting stations for colleagues and clients to circulate around - the price will vary according to numbers and staffing requirements so do contact us for a quote. To request a quote or find out about booking contact us on 020 8288 0314 or email us. Our Gins of the World Tasting will take you on a tour of the history and styles of gin. You'll sample 5 styles of gin from 4 countries. Made from a mash of various grains and flavoured with juniper berries and aromatics such as coriander and pink pepper, gin is incredibly diverse. Discover your preferred style and create a perfect G & T and Martini. The tasting is £40 per person with a minimum of 10 guests. 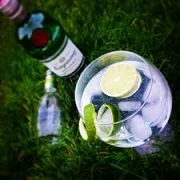 What's the story on garnishing your G&T? Our Gin & Fizz Cocktail Tasting has something for everyone in your group, with a combination of tastings and cocktail-making to refresh your taste buds! We bring along 3 different gins to show you the range of aromatic styles, from juniper-led dry gin to citrus and floral, along with plenty of bubbles for making delicious cocktails, such as a Kir Royale and French 75. We'll be helping you to mix your perfect G&T with Fever Tree tonics to get the gin to tonic ratio just right! A specific date can be booked directly with ThirtyFifty by choosing from the dates below. For gift purchases, you may prefer an open-dated gift voucher so that the recipient can choose which date they'd like to attend. For more details and upcoming dates please see below. Join us for an evening of gin tasting in London. The evenings are informal and fun, a real treat for gin lovers curious to find out more about the different styles of gin. Charcuterie and cheese platters are served during the tasting. To book an evening tasting select the date you'd like to attend below to add to your basket. Start time is 6.45pm for a prompt 7pm start. Each tasting lasts 2 hours, finishing at 9pm. Just wanted to say a massive thank you for yesterday's gin tasting - it was a really brilliant session and was VERY well received. You will be pleased to know that we continued on to a local establishment where we sampled more gin!